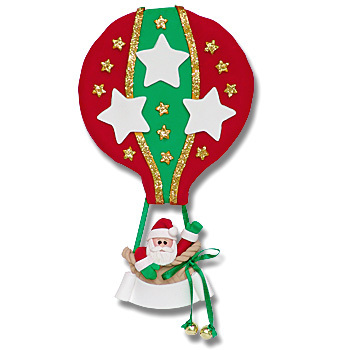 This hot air balloon is perfect for a family of 3, grandparents, groups, etc. Each and every ornament is designed by Debi Allison and all of our personalized ornaments are exquisitely handcrafted and detailed from polymer clay. Absolutely no molds are used. It is sprinkled with glitter for just the right amount of sparkle. This ornament is just one of the more than 500 different ornaments in the Deb & Co. line. Comes complete with hooks and satin ribbon for hanging.